It has been a while since I posted an idea for school lunchboxes. I make a mild filling for my girls. When I am in a rush or feeling lazy, I will use store-bought shortcrust pastry to save time. The puffs can be pre-made and freeze and bake later. Pastry: Rub the margarine into the flour until it resembles bread crumbs. Add water and mix to form a dough. Wrap in cling film (Gladwarp) and leave to rest for 30 mins. Filling: Heat oil in pan, saute the onions, curry paste, curry leaves till fragrant. Add in the chicken meat and stir well. Add potatoes, seasoning, and cook until dry. Taste and dish up. Cool completely before use. Roll pastry into 2mm thick, cut into 5cm rounds. Put 1 tsp filling onto the pastry and fold into semi-circle. Pinch to make decorative edge. Bake in the oven (160C) for 15 mins. Serve hot. I am sure these puffs are pretty good.. home made ones are always tasty! You are such a good cook. Amazed at what you have cooked here. Thanks for dropping by my blog. Hi Charmaine, you have a beautiful name. And can see you have a black belt in baking. 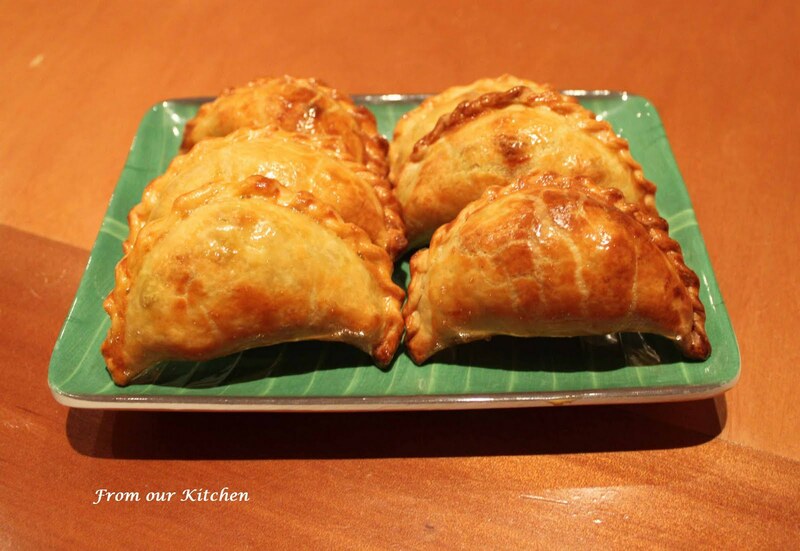 That curry puffs look delicious. Might have a problem eating one. Then we'll want a second, then a third, ha ha. Looks great..should try out your recipe one day. Charmaine, to the extend of making your own pastry? wow!! 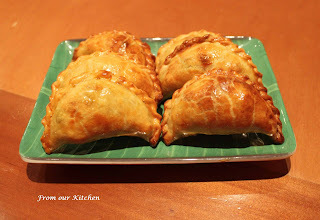 when i make karipap, i'll prefer getting the puff pastry from the frozen section, hehe..short cut! That looks yummy. It's not something I would have thought to make though since they're easily available. I sometimes use the store bought pastry too! Especially when I need to make a lot. Sent some in for a class party once, and the parents ended up eating most of it :) Your puffs look perfect, so neatly pleated.